Rene Barajas, who became the Dallas Independent School District’s Chief Financial Officer in January, has resigned to return to his former school district in Garland. Superintendent Mike Miles made the announcement on Wednesday in a press release saying that Barajas is going to be Garland ISD’s Deputy Superintendent of Business Operations. Before going to DISD, Barajas spent five years as Garland ISD’s chief financial officer. The school board president of West Independent School District says about half the district’s 1,463 students will return to school Monday, but at a different school, in a different district. That’s because three of West ISD’s four schools suffered damage from Wednesday’s explosion. A teacher who turns his class assignments into an iBook. Students who develop apps for mobile devices. QR codes that direct students to their teacher’s home page. These are just some examples of how some students are learning and keeping up to date with the latest technology. Gone are the days of a teacher standing in front of a classroom lecturing students. These days, students are using their smart phone or laptops. A Discussion About African American Students' Education: What Happens Next? The first two-day Summit on the Education of African American Students in DISD this past weekend got people thinking and talking about one of the most pressing issues, but the real challenge will be what comes out of that conversation, say those who attended. “It’s always a great exercise to have a discussion about education, and it’s always a great exercise to talk about the inequities, but to me what’s most important is the action,” says Sherasa Thomas, a former teacher who now works as an education consultant for Big Brothers Big Sisters. Dozens of teachers on Thursday attended a recruiting fair hosted by the City of San Antonio at the Dallas Public Library. The lure? A potential job teaching pre-K students and the chance to earn between $60,000 and $90,000 a year. The Sigma Phi Epsilon chapter at Southern Methodist University has been suspended for two years from campus. The suspension comes after the alleged assault of a member of another faternity at the Sigma Phi house. Parents, students and teachers in Fort Worth ISD can now stay digitally connected with the district and its schools. The district has launched a new free mobile app for smartphones. The Dallas County medical examiner's office on Friday ruled the Mount Auburn Elementary School student's death accidental due to food asphyxia. The boy has been identified as Manny Ramirez. A four-year-old boy died Thursday morning after choking on his lunch at school. In these cash-strapped times, education officials are looking for ways to spend less money. But how to do that and serve kids their daily dose of green beans or other veggies? School districts in five states, including the Dallas Independent School District, have decided to team up to share their lunch menus. A new study of middle school students found differences in academic performance and social behavior between kids who dated and those who had a less active dating life. Pamela Orpinas, a professor in the College of Public Health and head of the Department of Health Promotion and Behavior at the University of Georgia, studied a group of 624 students from sixth to 12th grade over a seven-year period. Millions upon millions of people are on Twitter, especially student-aged users. Teachers are trying to catch up by learning how to use Twitter in class. After two decades leading one of Dallas’ most storied private schools, Arnold Holtberg, Headmaster of St. Mark’s, says he’ll retire at the end of the 2013-2014 school year. By then he will have served 21 years, making him the longest tenured headmaster in the school’s 106 year history. Austin's South by Southwest has recently grown into more than ground zero for music, art and film. It’s also become a launching pad for the latest digital developments, and education has moved to the head of the high-tech class. Texas public college and university enrollment rose by 22.5 percent between 2007 and 2012, but state funding fell. Highland Park High School officials say they’re continuing with the school day despite the discovery of another threatening note. A Highland Park High School student found a handful of .22 caliber bullet shells in a bathroom Wednesday, and the school's 2,000 students were sent home early for the second consecutive day. The University of Texas System Board of Regents has named the current provost at the University of Alabama in Huntsville as the only finalist to succeed retiring President James Spaniolo. School districts and their lawyers hope a state judge’s ruling will force Texas to spend more money on public education. 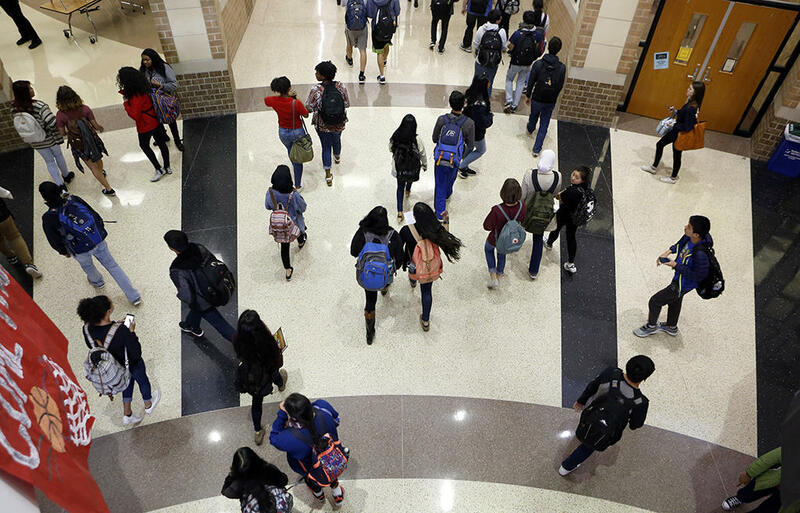 An Austin judge is expected to announce Monday whether Texas’ school finance system is constitutional or must be overhauled. It’s a decision that could lead to greater funding of public schools. As part of a nationwide public broadcasting initiative called American Graduate, KERA is following a diverse group of North Texas eighth graders all the way through high school. Today in the series “Class of ’17,” we meet a kid whose dad dropped out of college but passed on a love of hoops and a passion for hard work. It’s too soon to know if Texas schools will find it hard to comply with a new federal rule. It says schools must give students with disabilities a fair chance to participate in sports. The Garland School Board has unanimously picked Dr. Rob Morrison as its lone finalist to be the next GISD superintendent. The statistics are shocking: One of every four kids in an American high school drops out. That’s why KERA has joined a national public broadcasting initiative, called American Graduate, to explore the dropout crisis. Today, we’re starting a new series called Class of ’17 that will follow a handful of North Texas eighth graders from across the economic and ethnic spectrum all the way to high school graduation. First up: a 13-year-old dealing with his parents' divorce and a learning disability -- on the basketball court. North Texas parents are complaining the state demands too many tests for their kids to succeed in school. Texas Education Commissioner Michael Williams says he’s heard the complaints and agrees: Schools and student learning need to be evaluated differently. State lawmakers are preparing to file a slew of bills that could change the way students are tested and the way school districts are graded. The lightening rod is the new STAAR end-of-course exams. As part of KERA’s American Graduate program, we visited the Arlington school district where there’s a loud cry for reform. Education Commissioner Michael Williams is a big presence. His deep, hearty laugh and his 6-foot frame fill the room as he talks school policy with educators who came to hear him speak last week. If voters had chosen differently, the 59-year old lawyer and former Texas railroad commissioner -- the first African-American elected to statewide office -- would be sitting in Congress. But he lost the Republican primary last year. Then his close friend, Gov. Rick Perry, appointed him education commissioner.